Our premium beer glass range is a great gift idea for any beer enthusiast. Easily craft your own unique message onto a premium beer glass in seconds using our intuitive web design platform. We provide plenty of custom text real estate to help you embed the perfect personalised message. Choose to engrave an entire name or just initials - for the classy gentleman. 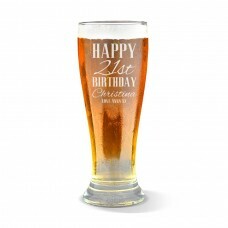 We even offer a thematic range of premium beer glasses for you to customise, so your gifts are sorted for all father’s day, birthday and wedding celebrations. If your dad needs proof that he is the world’s best, we have a premium beer glass that will do just that! 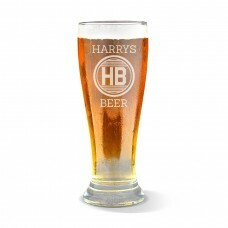 All of our premium beer glasses are made from high-grade glass that looks and feel absolutely prestigious in your hand. We even have a St Patrick day beer glass for you to customise to make this day feel more personal. Our highly specialised laser engraving machines ensure that all our designs are protected from fading, regardless of daily use. Once the designs have been submitted, you can receive them in one of two ways: Absolutely FREE – Come pick it up from the store, we’ll email you when it’s ready! Mail Delivery – we offer both standard and express delivery options Have the perfect custom design in mind? Start designing today!